Virtual reality is one of the most exciting technologies currently sweeping the market. Long an object of video gamers’ dreams, VR headsets have made virtual reality on your smartphone a reality. For the first time, virtual reality is a legit market. The market is quite saturated. All it takes is one trip to the local electronics store, and you’ll see countless brands of VR headsets, seemingly with few differences other than what company is selling them. From games to movies and other activities, the world of virtual reality is huge and it will only grow in the coming years. One of the best parts of this technology is that it is affordable–many VR headsets are compatible with any smartphone, and most don’t cost much at all. With so many products out there, it may seem like a tough task to choose which one to purchase. Fortunately, we’ve created this list in order to help you decide which of all those products are the best VR headset for Android enabled smartphones, and also your specific situation. Although these headsets may look like they’re all the same, they actually have many differences. For example, some headsets will only work with certain phones, either based on their screen size or the phone’s manufacturer. Some VR headsets will work with any type of Android (or iOS or Windows, for that matter) phones, but some will only work with specific brands of phones. It’s vital that you do your homework and understand which VR headset is right for you before you make the purchase. Other differences in the VR headsets relate to material quality, compatibility, and durability. As with most things, you sometimes get what you pay for–although some of these headsets are super cheap, they may break more easily. If you’re reading this guide, that means you’re interested in checking out the amazing world of virtual reality. Fortunately for you, this guide is going to help you make the most of your Android phone and find the best VR headset for you. We selected five different products as the best VR headsets for Android, and one of them was a step above the rest. Overall, we selected the Google Daydream View as the best headset. Any of the five would be great purchases, though, so read through our guide, and get excited about experiencing the most exciting technology trend in years. To determine which headset was the best VR headset for Android phones, we looked at a lot of products. These headsets are, of course, only compatible with cell phones. If you’re more interested in PC virtual reality gaming, you should read our article about VR ready laptops. A lot of the performance of your virtual reality experience will be determined by your phone, not the headset itself. If you have cracks on your screen, a poor battery life, or a very old phone, you won’t get results as good as someone who has a top of the line phone. We didn’t take into account the quality of the phone when considering which VR headset was the best. Instead, we used the below criteria, listed in descending order, to determine our final winner. These criteria determined which of the headsets we considered would take home the top prize. It is vital to distinguish between all the headsets that are out there when deciding which one to buy, and we thought these criteria were the best way to do that. 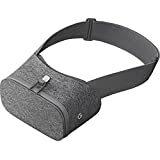 The most important factor for us when we were selecting the best VR headset for Android was the quality of the material the headset was built out of. One of the biggest distinguishing features of the various headsets currently on the market is the quality of the material it’s made of. Many of these products are made of cheap, breakable plastic that won’t last very long at all, and some are made of more quality material that will last for years. You may notice that one of the products on our list is made of cardboard. It made the list because of how cheap it is, not necessarily because cardboard is better than the plastic that some of the more expensive headsets are made of. There are many moving parts to these headsets, including straps, clips to hold your phone, and dials to adjust the eyepieces. A cheaply made headset will certainly fail before too long, so the quality of the material is essential when determining which headset to buy. Although these headsets are usually used indoors in your home, that doesn’t mean we want a huge, ugly piece of plastic adorning our heads when we’re using them. That’s why we took into account the way these products look, from the materials they’re made of to the way they fit on your face. Although these products are relatively cheap, some of them are made of high quality materials that look like they cost a lot more. We gave extra points for build quality. If a headset looks nice, people are going to be more likely to want to try it, and who doesn’t love showing off their new toy? The next criteria we used to sift through all the products out there was price. Obviously, containing no technology themselves, VR headsets are not going to be nearly as expensive as the phones you’ll be putting in them. However, many of these headsets are cheaper than others, so we gave extra points to products that kept quality high and price low. More money in your pocket is always a good thing. And at the end of the day, VR headsets are really just the conduit between you and your virtual reality phone applications, so a very expensive one wouldn’t make much sense. Nothing is worse than buying a product and discovering it only works with some of the existing technology out there. For example, some VR headsets are constrained to phones of a certain size. For a family that may have a variety of different phones, this could pose a problem. That’s why we chose versatility as one of our criteria to use. VR headsets that were more versatile got a bump in the rankings. A more versatile product is a better product, and that holds true even for VR headsets. Some headsets have other, miscellaneous features, and we took those into account when compiling our list. 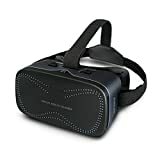 Sure, the primary function of a VR headset is to hold your cell phone in front of your face, thus allowing you to access the amazing world of virtual reality. But some headsets offer features that enrich the experience greatly. For example, some headsets (most of them, in fact) include things like adjustable head straps and adjustable phone docks. But features like adjustable eye pieces, being washable, or having an outstanding controller included simply makes the headset even better. After combing over countless products, using the five criteria we discussed as judgement, one VR headset came out on top as the best VR headset for Android devices. The Google Daydream View from Google was our favorite of all the products we looked at. It combined great material quality, style, versatility, price, and miscellaneous features into one package, and it works out extremely well. First, the material quality on the Daydream View is unmatched, and also very unique as far as VR headsets go. It’s got a soft, fabric design that holds up well to wear. It’s lightweight without losing durability, and that makes the Daydream one of a kind in the VR headset market. The style of this headset is perhaps the best part of it. The pattern of the fabric is very attractive and comes in three colors: crimson, slate, and snow. There’s no denying that the fabric material simply looks way better than its plastic competitors, offering a level of comfort and quality that plastic can’t provide. This product is also extremely versatile. It works with a variety of sizes of Android phones, and it can even adjust to accommodate people who wear glasses. The intuitive remote is also compatible with a wide variety of phones that run on Android, so no matter what phone you own, this headset will likely work for you. Finally, the Daydream View packs a ton of miscellaneous features in. Its fabric shell is actually washable, so it will always remain clean and spiffy. It’s intuitive remote control is one of the better ones out there; it allows you to become immersed in the virtual reality rather than struggle with the controls. The comfortable, breathable mesh on the forehead attachment is incredibly comfortable–you’ll be able to wear it for hours. As you can see, the Google Daydream View VR Headset for Android is a grand slam of a product. It excels in all five of our focus areas, and does so while remaining very affordable. It was an easy choice; the Daydream View is the best VR headset for Android. The Victony 3D VR Headset is an outstanding budget virtual reality headset. It’s main draw is that it costs very little while packing in a surprising number of features. It lacks the flash and material quality of other headsets, but you may be able to look over that when you see the price tag. It’s materials are cheap and plasticky, there’s no doubt about that. But fortunately, the Victony 3D makes up for that with a plethora of miscellaneous features that make the experience amazing. You can adjust both pupil distance and focal distance, as well as a magnetic remote control. It also has a breathable mesh piece that attaches to your forehead, allowing for hours of comfortable use. The price is the real feature here–for around twenty bucks, you can afford some cheap hardware. The popular Samsung Gear headset made our list as well. As you can expect from one of the largest manufacturers of cell phones on Earth, the Gear is high quality in almost every aspect. A polished product all around, you can’t go wrong with the Gear. The material it’s made of is plastic and does feel a little cheap for the price, but it is durable and high quality. One of the best features is the touchpad control on the device, removing the need for a remote control for basic things. It also packs in features like an accelerometer, a gyrometer, and mounting and unmounting detection that will pause your media if your phone comes undone. All in all, the Samsung Gear is an outstanding product, albeit a little pricey compared to some similar models. This product is a little unconventional–this headset is made exclusively from paper. Billed as the no frills version for virtual reality headsets, the Cardboard is exactly what it’s named–cardboard. The clever user friendly design will work with whatever Android smartphone you put in it. It’s obviously extremely affordable, too, at around 15 bucks. Although it doesn’t come with any fancy features, for users who don’t care much about the frills, the Cardboard is a great way to get into virtual reality. If you’re a more serious user that will be using VR for a long period of time, the Cardboard may not be for you. But if you want to enter the VR game in a casual way, the Cardboard is a fantastic place to start. The final headset on our list is the Storm Xmen. This affordable product comes in both red and black and is a great cheap multipurpose headset for virtual reality. It’s got optical lenses with anti-distortion coating, ensuring a fantastic viewing experience. This headset may look pretty ugly, and it might not look good for those of you concerned about style when wearing your VR headset. But the Xmen, from a relatively unknown company called Storm, is a good choice for the budget-conscious consumer. It does have some interesting features. For one, it has a “vent” on the front for your phone, which is meant to keep it cool for long use. It also has a wide usage capability, and will work with most Android smartphones and even some iPhones. Virtual reality is an exciting advancement in the world of consumer technology. Affordable VR headsets for popular smart phones is perhaps the most popular way people are experiencing virtual reality right now, and picking the right headset for your situation is vital in order to have the best experience. In this list, there were five very good products. In the end, we went with the Google Daydream View, because it had the highest quality in all five of the criteria we looked at. It’s innovative, fabric covering looks stylish, is durable, and encases a product that excels in providing an outstanding VR experience. We were meticulous when we sifted through all the VR headsets out there, and we hope that this guide will help you experience the wonderful, emerging world of virtual reality. Get yourself an entry-level VR headset and immerse yourself in the virtual world. We look at the Best VR Headsets for Android phones in this review.